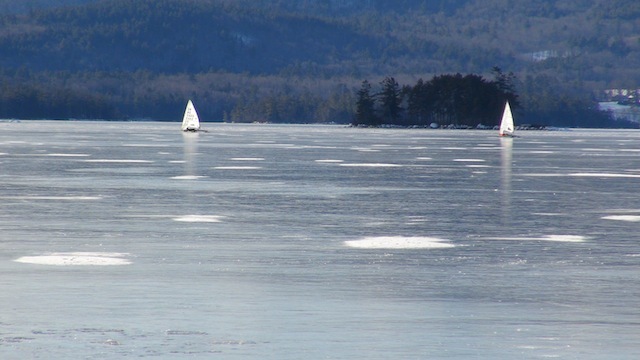 ClarkSail reporter Willy Clark recently got his first shot at iceboating when he followed the New England Ice Yachting Association to Squam Lake, New Hampshire for the 2013 Doc Fellows regatta. After a day spent watch the runners go by one thing is clear â€“ it takes a special type to be an iceboater. Below are some of Willyâ€™s thoughts on the matter. 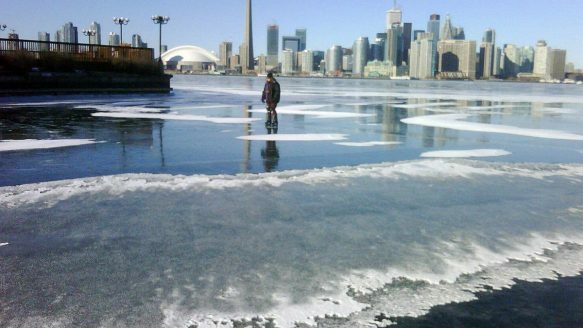 Skating on natural surfaces like Lake Ontario isn't condoned by the city of Toronto, but a few hardy experts won't give up on tradition. Like Joni Mitchell, many of us wish we had a river to skate away on. The record high temperatures this summer could mean some Great Lakes coastal residents will get buried in snow this winter. Sailing On Ice? Yeah, That's A Sport. The minute I learned that ice sailing was an actual sport, I wanted to give it a try. I watched YouTube videos of wooden boats with big white sails zooming across the ice on steel runners. It seemed like such a rush: Imagine racing over a frozen lake on a wind-powered sled, hitting speeds that top 40 miles an hour. So I was delighted when Andy Sajor, of Plattsburgh, N.Y., offered to let me hitch a ride over an icy Lake Champlain. The 13th largest lake in the country, Champlain sits between upstate New York and Vermont and has emerged as one of the best ice sailing venues in the U.S. The U.S. Coast Guard Station Duluth warned the public of unsafe ice Sunday. A warm winter is keeping the ferry running between Madeline Island and Bayfield ... much to the chagrin of islanders. The ice road is all people talk about these days at the Beach Club on Madeline Island. Leslie Mack knows. She goes there during happy hour. DILLON - At the Dillon Marina, the boats are in dry dock, wearing their white winter plastic coats and an 8-inch layer of ice now covers the Reservoir. But Dan Burnett's short and sweet sailing season has just started. "Lake Dillon gets between a week and two weeks of good ice boating," said Burnett. The Great Western Challenge is the official start to the Iceboating season for those of us in the USA. It has grown in popularity and this year over 75 Iceboats gathered in a remote Minnesota town called Ashby, which has Lake Christina. The lake is round, about 2 miles by 2 miles and the ice was nearly flawless! As the season draws to an end, boaters find themselves with the age-old question of how to get through the long, cold Maine winter. Some enjoy winter sports like skiing, snowshoeing or snowmobiling. Many will spend the off-season on boat improvement projects. Others will go south and charter a boat for a week or two. The really lucky ones take their own boats south and spend the winter where it's warm. A total of 28 pages are available.